Spinnin' Records has teamed up with recognized earplug supplier Earproof for the global campaign MORE MUSIC. Goal is to create awareness for the effect loud music can have on the ears, underlined with the creation of exclusively made Spinnin' earplugs. It's a well known problem in the music scene, the noise your ears are exposed to during concerts and dance events. As one of the world's leading dance music labels, Spinnin' Records is aware of this problem, and wants to actively contribute to a solution. And so, MORE MUSIC came into life, a global campaign by Earproof and Spinnin' Records to create more awareness and make people enjoy safe listening levels of music during events. For this, exclusive Spinnin' earplugs were made, containing a special music filter that provides the ears with extra protection. The earplugs are well designed and made of medical grade environmental friendly TPE, making the earplugs soft and comfortable to wear. At the same time the music earplugs let you experience music as beautiful as possible. The special music filters give a flat attenuation that will make you experience the entire frequency range. In effect, the music sounds balanced and you do not suffer from distorted sound - you actually hear MORE MUSIC. Drop by the Spinnin’ Pop-up Store during the Amsterdam Dance Event for Spinnin' artist merchandise, A & R sessions, Meet & Greets with DJs, new tunes and new Spinnin 'earplugs. You can find it at the Reestraat 14 in Amsterdam, open during ADE from 19-23 October. 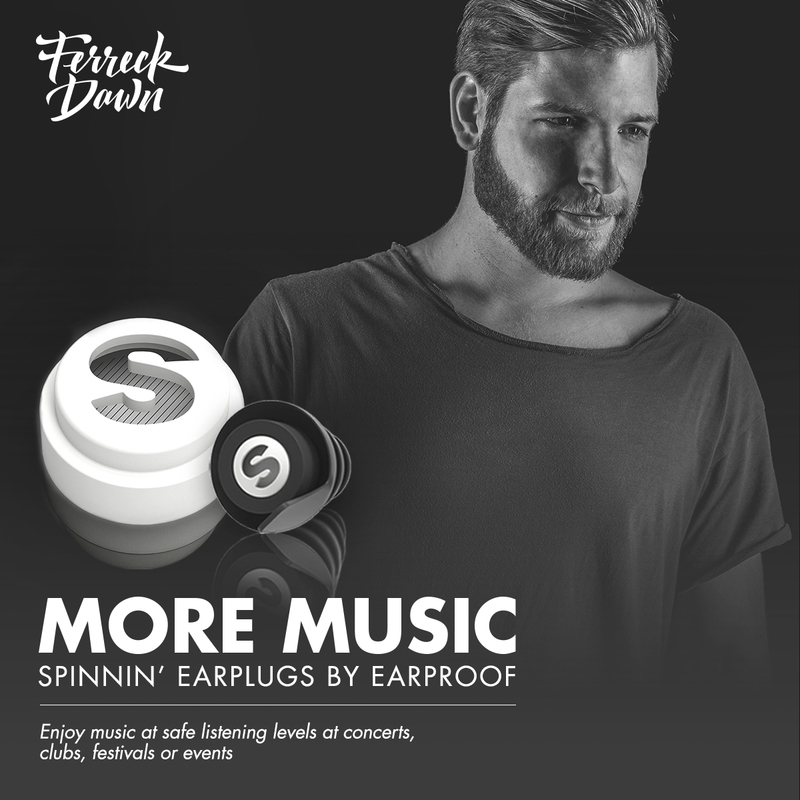 For this campaign, Spinnin' Records / Earproof got together with world renowned deep house artist Ferreck Dawn, who's experienced ear damage and was happy to join MORE MUSIC.